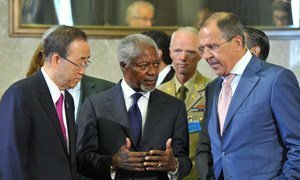 Left to right: Secretary-General Ban Ki-moon, Joint Special Envoy Kofi Annan, Major-General Robert Mood and Russian Foreign Minister Sergey Lavrov in Geneva. Secretary-General Ban Ki-moon has welcomed the agreement reached recently by the Action Group on Syria and the determination expressed by the group’s participants to work jointly to resolve the crisis in the Middle Eastern country. “This includes the proposed establishment of a transitional governing body, with full executive powers, as part of important agreed principles and guidelines for a Syrian-led political transition that would meet the legitimate aspirations of the Syrian people,” Mr. Ban’s spokesperson said in a statement issued overnight. The UN-backed Action Group held its first meeting last Saturday, at which it forged an agreement outlining the steps for a peaceful transition in Syria, while strongly condemning the continued and escalating violence that has taken place there over the past 16 months. The Action Group also called for all parties to immediately re-commit to a sustained cessation of armed violence, to fully cooperate with observers serving with the UN Supervision Mission in Syria (UNSMIS), and to implement the six-point peace plan put forward earlier this year by the Joint Special Envoy for the UN and the League of Arab States on Syria, Kofi Annan. He added that the Syrian Government and all parties on the ground must take heed of international calls to engage genuinely with Joint Special Envoy Annan, cease all violence and recommit to the six-point plan in its entirety. “The Syrian people and the region cannot afford more atrocities, suffering and chaos,” he said. Mr. Annan’s six-point peace plan calls for an end to violence, access for humanitarian agencies to provide relief to those in need, the release of detainees, the start of inclusive political dialogue, and unrestricted access to the country for the international media. Mr. Ban’s spokesperson also said that the UN chief hopes that a meeting – which started in Cairo on Monday and continues today – of the League of Arab States with the Syrian opposition will contribute to the efforts of Joint Special Envoy Annan and the international community to pave the way toward a meaningful transition in Syria. “It is important that the Syrian opposition increase its cohesion and designate effective representative interlocutors,” the spokesperson noted. He added that Secretary-General Ban remains gravely concerned about the escalating violence on the ground and urges the parties to cease violence now and allow humanitarian workers to reach those in need of assistance urgently. At its meeting on Saturday, the Action Group also agreed on a set of principles and guidelines for a Syrian-led transition that meets the aspirations of the Syrian people, which includes the establishment of a transitional governing body that would exercise full executive powers and that would be made up by members of the present Government and the opposition and other groups. In addition, it agreed on actions that they would take to implement the steps and measures outlined in the statement, and to support Joint Special Envoy Annan's work in bringing the relevant parties together. The UN estimates that more than 10,000 people, mostly civilians, have been killed in Syria and tens of thousands displaced since the uprising against President Bashar al-Assad began 16 months ago. Action Group members include the Secretaries-General of the United Nations and the League of Arab States, Ban Ki-moon and Nabil Elaraby, respectively, the Foreign Ministers of the five permanent members of the Security Council – China, France, Russia, the United Kingdom and the United States of America – as well as the Turkish Foreign Minister, the High Representative of the European Union for Foreign Affairs and Security Policy and the Foreign Ministers of Iraq, as Chair of the Summit of the League of Arab States; Kuwait, as Chair of the Council of Foreign Ministers of the League of Arab States and Qatar, as Chair of the Follow-up Committee on Syria of the League of Arab States. The United Nations-backed Action Group on Syria today forged an agreement outlining the steps for a peaceful transition in the Middle Eastern country, while strongly condemning the continued and escalating violence that has taken place there over the past 16 months.